In 1346 Edward of Woodstock commanded the frontline at the Battle of Crécy, his father King Edward III of England, intentionally left him unsupported to win the battle, so he could “earn his spurs” in combat. Prince Edward is alleged to have gained the nickname the Black Prince for his affinity for using black armor. In the summer of 1356 the Black Prince and his army drove northward toward the Loire, attacking once again deep into French territory. This time he met real opposition: the full French army led by King Jean II (John II). Outnumbered, the Prince fell back, but in September he turned near the city of Poitiers to make a stand. At the Battle of Poitiers (19 September 1356), an army of English troops, many of them veterans of Crécy, soundly defeated a much larger French and allied army, leading to the capture of King John II of France, his son, and much of the French nobility. This, the climactic event of Prince Edward’s first campaign as sole commander, came at the end of nearly of a year of campaigning across the southwest of France. The capture of a king in the course of a battle was a relatively rare event in the Middle Ages, and this battle was a resounding victory for the English forces. Poitiers was the second major English victory of the Hundred Years' War. Poitiers was fought ten years after the Battle of Crécy (the first major victory), and about half a century before the third, the Battle of Agincourt (1415). The effect of the defeat on France at Poitiers was calamitous, leaving the country in the hands of the Dauphin Charles. He faced populist revolts across the kingdom in the wake of the battle, which had destroyed the prestige of the French upper class. The Edwardian phase of the Hundred Years War would end four years later in 1360, on favorable terms for England. 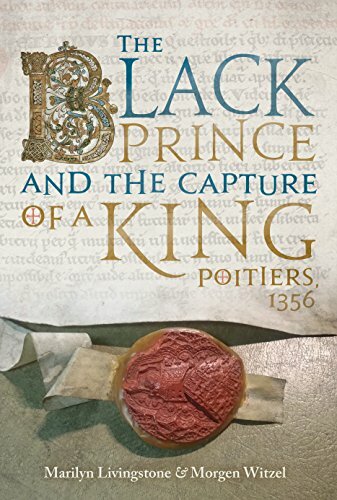 The Black Prince and the Capture of a King: Poitiers, 1356 co-authored by Marilyn Livingstone and Morgen Witzel is a detailed account of the battle that saw one of the most dramatic episodes of the Hundred Years War: the capture of the French king. Livingstone holds a master’s degree in medieval history and a doctorate in economic history from Queen’s University, Belfast. Witzel is a Fellow of the Centre for Leadership Studies at the University of Exeter Business School and a writer on history of business and management. In 2004, they co-authored The Road to Crecy: The English Invasion of France, 1346. The core of the book is a day-by-day description of the campaign of July–September 1356, climaxing with an abbreviated account of the Battle of Poitiers itself. The interpretation and analysis of the battle and the campaigns that led up to it has a strong focus on the people involved in the campaign: ordinary men at arms and non-combatants as well as nobles. Overall, this book is a quick read (224 pages) and does an adequate job of detailing the basic facts of the events leading up to and following the battle. The discussion of the day-to-day life of the armies is informative, but ultimately isn’t enough to garner any true enthusiasm. There’s no doubt that the authors are very passionate about the subject but be warned the writing style is a little bit dry and reads more like a text book. If you’re a novice historian and like fast reads this book is worth checking out.